Vit Perina (1978) focuses on the stories for children and youngsters, with humorous hyperbole, re-interpreting traditional fairy tales with surprising updating moments or creating his own fables where the world of animals hyperbolizes into the grotesque form of people’s world. The plays are characterized by humor, poetic exaggeration and playfulness. Vít Peřina (*1978). Graduated from the Faculty of Philosophy, Palacky University in Olomouc (Departments of Art Theory and History and Czech Studies). 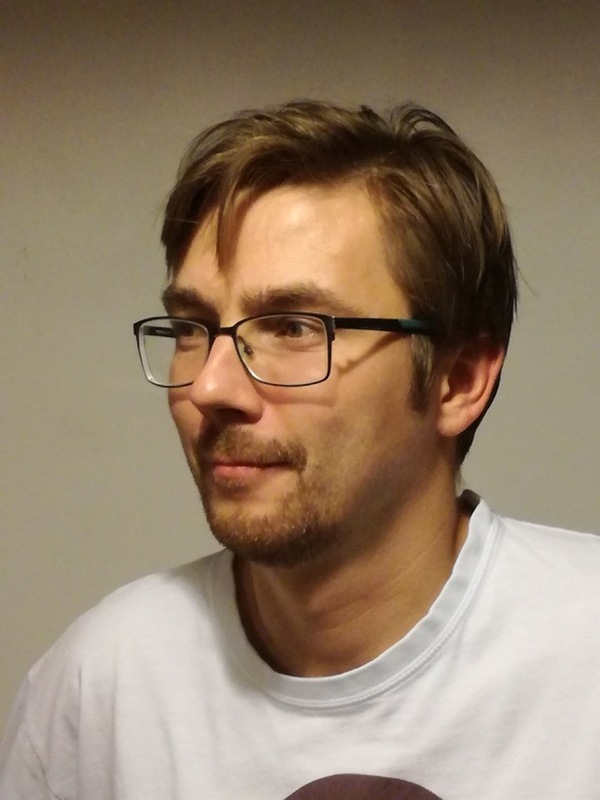 Since 2003, he has been working as a dramaturg at the Naive Theatre in Liberec and he also writes (fore mostly puppet theatre) plays, mainly for theatres for children and the youth. As an author he cooperates, for example, with Naive Theatre in Liberec, ALFA Theater in Pilsen, Theatre DRAK in Hradec Králové, Puppet Theater in Ostrava and many others. His plays were also performed in theatres in Poland or Slovakia. As an author also occasionally cooperates with Czech Television and Czech Radio. His plays and dramaturgical cooperation were repeatedly awarded at the Czech puppet theatre festivals (Mateřinka Festival Award for the production of Letter Soup, Cook, Cup!, Budulínek, The Lamb that Fell from the Sky, Bohemia Lies by the Sea; Skupa’s Pilsen Award for the play Komensky’s Lesson). He has twice won the prestigious annual Theatre Newspaper Award for Outstanding Performance in Alternative Theatre (for the play Budulínek, and co-authorship of the Bohemia Lies by the Sea). Budulínek is not listening to his grandparents, his Grandpa and Grandma have a trouble hearing and the fox hears way too much. The text respects the well-known plot of the classic Czech fairy tale about the disobedient boy but develops it with a number of innovative motifs. The topic of listening in this case is not only about the disobedient Budulínek or the hypersensitive ears of the sneaky fox, but also about Budulínek’s grandparents, who, on the contrary, hear almost nothing. Both of them love to play musical instruments. And not just any instruments – Grandpa bought a complete drum kit and grandma an electric violin. It’s not surprising, because of all this loud music, that they have visit their ear specialist quite regularly. Their frequent absence is abused by the sneaky fox who will kidnap small Budulínek into her bush and hopes that the boy will entertain her unruly baby foxes as their shouting constantly hurts her ears. The rescue operation organised by two somewhat deaf rockers will bring unexpected denouement and surprising revelations. There is also a lesson to be learned as in every proper fairy tale. The play was first performed at the Naive Theatre in Liberec and received a number of awards, including the Erik Award for Best Czech Puppet Production of the Year. The author of the play received the Theatre Newspaper Award for Outstanding Performance in Alternative Theatre as well as the 2013 Mateřinka Festival Award. The play is available in Czech and English. Animals usually swarm theatre production for children. Mostly you will encounter mice, sheep, bears, foxes and wolves, dogs and cats. Unusual is also the presence of a camel or a hippopotamus. But this play is dedicated to animals that are perhaps less visible, but more often we meet them in everyday life: mosquitoes. And to add up to it, other insects that mankind refers to as ‘troublesome’ appear on the stage as well: fleas, horseflies, ticks. For even these creatures have a right to their own fairy tale for children. Zdenda, the mosquito, is ready to enter the world of adult mosquitoes. But as the tradition has it, before his first ‘flight’ to the exposed calf of the mushroom picker, he has to fulfil one important task, find a bride. His good friends, Štěpán, the tic and Olda, the horsefly, help him with this quest. And since he’s secretly in love with the Firefly, who just got kidnapped by the wicked Spider, it is definitely worthwhile to join forces. The unusual trio of heroes, however, can be reminiscent (due to their looks and superpower abilities) fairy tale trio Mr. Long, Mr. Broad, and Mr. Sharpeye, so it is obvious that they will deal with all the pitfalls and the great insect adventure will end with a magnificent wedding. The text is available in Czech, the English translation will be available in the spring of 2018.